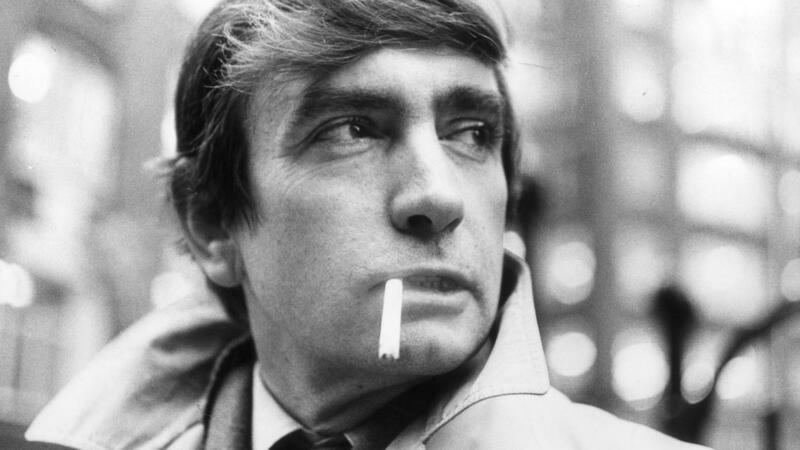 Edward Albee, pictured here in 1967, won three Pulitzer Prizes over the course of his career. Pulitzer Prize-winning playwright Edward Albee has been in the news a lot lately. Albee died in 2016, and since then his estate has turned down a multi-racial production of Who's Afraid of Virginia Woolf? and put his contemporary art collection up for auction for an estimated $9 million. Now The New York Times reports that his incomplete works may never see the light of day. The clause in Albee's will is pretty clear: "If at the time of my death I shall leave any incomplete manuscripts I hereby direct my executors to destroy such incomplete manuscripts." Albee's estate wouldn't comment on whether they've followed his orders, but the directive is very much in character — and Emily Mann isn't the least bit surprised. She's the artistic director of the McCarter Theatre Center in Princeton, N.J., and she worked with Albee on several plays. "He wanted to have authority over everything of his that was on the stage," she says. That meant casting, props and even the color of the set. Mann says the playwright was so exacting that when actress Rosemary Harris was rehearsing his play All Over, "He wrote me a note on one of Rosemary's lines which was, 'I didn't hear the comma.' "
According to Mann, whenever they worked on a new play together, Albee pretty much kept his writing a secret. There were never readings or workshops, just a final draft. The playwright told me in a 2008 interview, "I don't think a play should go in rehearsal until it's ready to open." That's where the incomplete manuscripts come in. Albee's last work, Laying an Egg, was supposed to open off-Broadway, but it was postponed twice because the author said it wasn't ready. Now we may never know what was in that play. David Crespy is president of the Edward Albee Society, which promotes scholarship on the playwrights work. "It's a very disappointing decision," he says. "... It's kind of a way of shutting us out of Edward's creative process — which, by the way, he wanted to shut us out of his creative process." But in the past, other estates have chosen to ignore authors' wishes. Franz Kafka asked for his work to be burned, and it wasn't; the play Long Day's Journey Into Night was staged shortly after playwright Eugene O'Neill's death, even though he asked for a 25-year waiting period. David Friedlander is a lawyer for theater productions. He says the Albee estate's decision may be a loss for future scholarship on the playwright, but it's well within its rights: "Authors, when they're working on drafts of things, they might write things that are poorly written, for one; ideas and concepts that are incomplete, or characters that are incomplete; or they may write things that are, you know, sexist or racist or politically charged that they may or may not really believe. But the artist, I think, has the absolute right to determine what gets disclosed." Albee exercised that right in his 2008 interview with me. When I asked about a new play he was working on, he gave a sly smile and said, "One is emerging, yes. ... It's called Silence, yes. Yes. That's all I will tell you at the moment about it." Pulitzer Prize-winning playwright Edward Albee has been in the news lately even though he died 10 months ago. His estate has turned down a multiracial production of "Who's Afraid Of Virginia Woolf?" It has put his contemporary art collection up for auction for an estimated $9 million. And today The New York Times reports his unpublished works may never see the light of day. Here's Jeff Lunden. JEFF LUNDEN, BYLINE: The clause in Edward Albee's will is pretty clear. Quote, "if at the time of my death I shall leave any incomplete manuscripts, I hereby direct to my executors to destroy such incomplete manuscripts." Albee's estate wouldn't comment on whether they've followed his orders, but the directive is very much in character. EMILY MANN: You know, I'm not in the least bit surprised. LUNDEN: Emily Mann is the artistic director of Princeton, N.J.'s, McCarter Theatre. She worked with Edward Albee on several plays. MANN: He wanted to have authority over everything of his that was on the stage. MANN: He wrote me a note on one of Rosemary's lines which was, I didn't hear the comma. LUNDEN: And Mann says that when they worked on a new play, Albee pretty much kept his writing a secret. There were never any readings or workshops, just a final draft. It's something the playwright told me in 2008. EDWARD ALBEE: I don't think a play should go in rehearsal until it's ready to open. LUNDEN: And that's where the unpublished manuscripts come into play. Albee's last work was called "Laying An Egg." It was supposed to open off-Broadway but was postponed twice because the author said it wasn't ready. What's in it? Now we may never know. DAVID CRESPY: Now, I can say to that it's a very disappointing decision. LUNDEN: David Crespy is president of the Edward Albee Society, which promotes scholarship on the playwright's work. CRESPY: It's kind of a way of shutting us out of Edward's creative process, which, by the way, he wanted to shut us out of his creative process (laughter). LUNDEN: But other estates have chosen to ignore authors' wishes. Franz Kafka asked for his work to be burned. It wasn't. "A Long Day's Journey Into Night" was staged shortly after Eugene O'Neill's death even though he asked for a 25-year waiting period. Theatrical lawyer David Friedlander says this might be a loss for future scholarship on Edward Albee, but the estate is well within its rights. DAVID FRIEDLANDER: I think that should be respected. You know, authors, when they're working on drafts of things, they might write things that are poorly written, for one, ideas and concepts that are incomplete or characters that are incomplete. Or they may write things that are, you know, sexist or racist or politically, you know, charged that they may or may not really believe. But the artist I think has the absolute right to determine what gets disclosed. LUNDEN: And when I asked Albee back in 2008 what he was working on, he gave me a sly smile and not much else. LUNDEN: I understand you have another play in mind at the moment. ALBEE: One is emerging, yes, yes. LUNDEN: (Laughter) And I understand that it's called "Silence." ALBEE: It's called "Silence," yes, yes. That's all I will tell you at the moment about it. (SOUNDBITE OF EL TEN ELEVEN'S "MY ONLY SWERVING") Transcript provided by NPR, Copyright NPR.